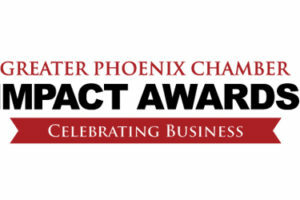 Since 1987, the Greater Phoenix Chamber has honored the accomplishments of businesses and the impact they make on the Greater Phoenix business community. The Chamber looks for companies with a strong footprint in the Valley that deserve special recognition. The Chamber recognized two businesses—one with 250 employees or fewer and one with more than 250 employees—in four categories. In total, eight companies are named IMPACT Award recipients. Phoenix Children’s Hospital and Equality Health were named business of the Year. Watch their reactions below. Weren’t able to attend the awards show? No problem. Watch our 2018 IMPACT Award recipients acceptance speeches below. Arizona Advocate – A business promoting pro-growth, pro-job policies that foster a business-friendly climate, advocating for Arizona on a state, national and/or global level as a unique place for businesses and individuals to thrive. Community Champion – A business focusing on local community involvement, volunteering and truly making a positive impact in the community throughout their company. Economic Driver – A business substantially contributing to the economic vitality of the Greater Phoenix community by creating new jobs and opportunities, advancing a new industry or revitalizing a business sector or neighborhood. Exceptional Innovator – A business exemplifying the spirit of entrepreneurialism. This business identifies opportunities or unmet needs and takes risks, creates value, initiates change or develops innovative solutions.